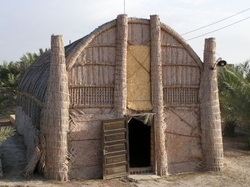 People in the reed-growing marshes of southern Iraq have been building complex reed structures since at least 4000 BC (see left). The modern Arabic word for these is a mudhif. If you follow the Youtube clip below (it also has a second part on Yoube) you can learn about how these are built. Downstream of the ancient city of Ur, the estuaries of the Euphrates and Tigris merge and there was about 40 miles of reedy marshland between the city and the open sea. Modern Basra is in the heart of this former marshland. Below is an impression from a cylinder-seal dating from about 3200-3000 BC - spot the mudhifs! They seem to be in use in the seal as cattle byres and perhaps store-rooms. 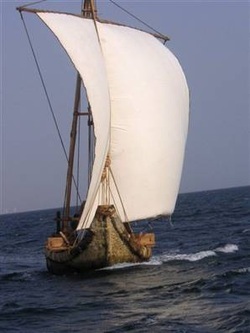 In 2005 a replica sea-going reed boat, the 'Magan', was launched from Oman. Sadly it sank within 30 minutes. The maritime archaeologist Tom Vosmer who led the Magan Project has not published anything since that I can locate about reed vessels. However there are numerous depictions of reed river boats from cylinder seals. Later in Mesopotamian archaeology, in the Assyrian period (500 BC-ish) there are scenes of battles that include reed river boats. But I suppose until a replica can be made that can cope with sea-going conditions, it's unsafe to assume longer-distance trade was carried by reed boats.